We are pleased to inform you that the registration for the upcoming Intercultural Training 2019 of Eötvös Loránd University, organized by the Erasmus+ and International Programmes Department and the Institute of Intercultural Psychology and Education (IIPE), Faculty of Education and Psychology IS NOW OPEN. The training will be held from 20th to 24th May 2019 and is targeted mainly to staff members of higher education institutions who work with international students and staff on a day-to-day basis and have at least one-year work experience in this area. 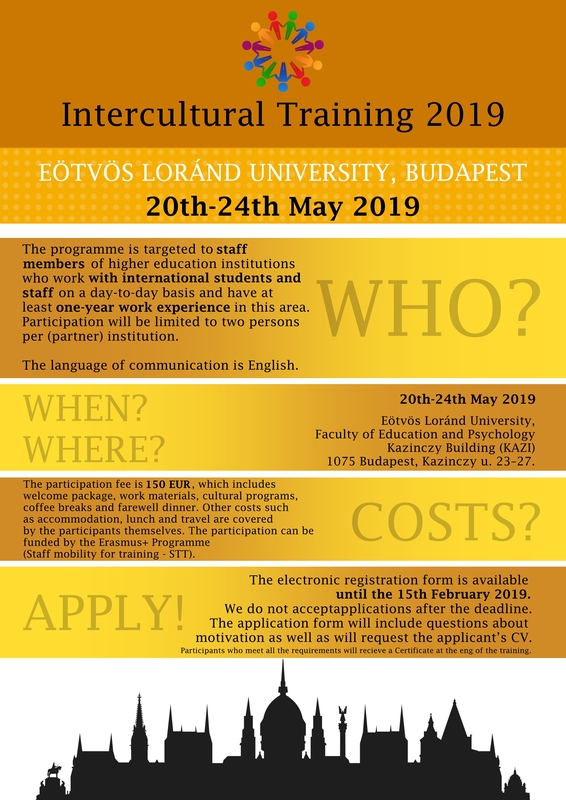 The training program aims to promote intercultural communication skills and competence especially for those who engage in intercultural encounters in their everyday work, who have a lot of experience but feel that they need to further develop their skills to be more successful. Participants who participate actively at the full course will receive a Certificate of attendance at the end of the training. The participation fee is 150 EUR and includes welcome package, work materials, cultural programs, coffee breaks and farewell dinner.